There were a few time when I thought I would lose my mind. There were times when I thought I could go on no longer. At times, I wanted to lash out at those whom I felt had done me wrong. But the Lord kept my mouth closed. Sometimes I feel that the money just isn't enough. But God has helped me keep the lights on, the water on, the car paid, the house paid, ect. When I thought I was weak, He kept me strong. I could go on and on, but I'm sure you know what I mean. I'm blessed to be kept. Do you know a kept person? If so, pass this on to them to let them know they are kept. I'm kept by the Love and Grace of God. ...there are a lot of choices. Genres, artists, albums, songs.... And then there's the choice of whether you want to listen to music that is glorifying to God, or stuff that doesn't. Personally, I'm fine with listening to music that doesn't glorify Him. As long as it doesn't have any cussing, or is suggestive, that is. I'm not saying that I don't listen to music that doesn't praise God; I do. Most of the time what I'm listening to is Christian music. But I don't think that it's wrong to listen to other stuff too. Why would it be? Of course, song is a great way to praise God, one of my favorites. Whether it's in a band or chorus, making up your own songs, or just singing along to music, it really brings you closer to Him. Some of my favorite Christian bands/singers are Vicky Beeching and Laura Story. I highly recommend them. If you have any recommendations, I'd love to hear them. I'd also love to hear your opinions on whether or not you think it's wrong to listen to non-Christian music. So please leave a comment! I'd like to share another of my favorite psalms with you. 1 How long, O LORD ? Will you forget me forever? 4 my enemy will say, "I have overcome him,"
1 How long will you forget me, Lord? Forever? How long will you hide from me? and feel sad in my heart all day? How long will my enemy win over me? 3 Lord, look at me. tell me, or I will die. 4 Otherwise my enemy will say, "I have won!" Those against me will rejoice that I've been defeated. 5 I trust in your love. My heart is happy because you saved me. because he has taken care of me. Finding Jesus, but He was never lost. LOLcats never usually give me anything more than a laugh, but I have been pondering this one for a few days. It's so true, when it seems like nobody is near, Jesus is really just on top of the bookcase waiting for us to find him. He is always there, he was never lost, we were. I thought that I'd tell a little bit about a few different versions of the Bible. The KJV Bible was first published in 1611. It has been revised several time and the 1762 revision is what we now know as the King James Version. 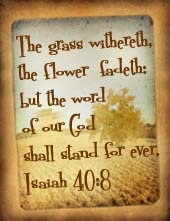 It has been the bestselling book for four centuries and is the most used Bible. It is probably the most accurate modern version available. I love it because of it's beautiful, poetic wording. It is also my favorite version. But, many people don't like it because it can be harder to understand that newer versions and uses out-of-date words like thou and hast. Also very used The New King James Version was written in 1982. It is very much like the King James Version, but it doesn't have words like thou and hast. I would say it us the most accurate yet understandable version available. Yet another very used version, the New International Version was written in 1973. It is very understandable, but still flows nicely. Most study Bible are the NIV version and many churches use it during service and in the pews. "For God loved the world so much that he gave his only Son. God gave his Son so that whoever believes in him may not be lost, but have eternal life. " The International Children's Bible was written in 1986. It uses small words and simple language that is easy for children to understand. 16 "God loved the world so much that he gave his one and only Son so that whoever believes in him may not be lost, but have eternal life. " The New Century Version was written in 1987. It is very easy to understand, yet somehow, it retains the beautiful wording like the older versions. I find it to be the most enjoyable version to read and a the best version since the King James. The Message was published in segments from 1993 to 2002. It's wording is almost like a Bible study, it speaks directly to the reader. It is by far, the easiest version to understand, but the poetic beauty is lost. Despite that, I think it is a remarkable version. What is your favorite version, which one do you use and why? Hello, sorry I have not done the weekly Bible verse, I have been to busy. Speaking of which, I think that a weekly Bible verse is too much. How about monthly or bi-weekly. What do you think? A false  balance is abomination to the Lord: but a just weight is his delight. 5 The righteousness of the perfect shall direct  his way: but the wicked shall fall by his own wickedness. 6 The righteousness of the upright shall deliver them: but transgressors shall be taken in their own naughtiness. 12 He that is void  of wisdom despiseth his neighbour: but a man of understanding holdeth his peace. 13 A talebearer  revealeth secrets: but he that is of a faithful spirit concealeth the matter. 15 He that is surety for a stranger shall smart  for it: and he that hateth suretiship is sure. 22 As a jewel of gold in a swine's snout, so is a fair woman which is without  discretion. 25 The liberal  soul shall be made fat: and he that watereth shall be watered also himself. 30 The fruit of the righteous is a tree of life; and he that winneth  souls is wise. Aaaaahhhh Christmas, My favorite time of year. The family and friends and God. I cannot believe that is has come so fast. I Love Christmas and I have been counting down the days till Christmas. Ah, only a few more days until Christmas. Just the thought of the food, the presents, and the fun is making me happy. But too often -far too often- we forget what the season is really about. And what I have been wondering lately, is that if someone doesn't believe in God, then why do they celebrate Christmas? If you take away Christ from Christmas, what do you have? Christmas - Christ = mas. And what, now, exactly, is a mas? I don't know either. So if all of these people -people who don't believe in God- aren't celebrating Christmas, what are they celebrating? I truly just don't get it. Christmas has become too commercial, too material. It's too much about 'Santa Clause' and presents. And worse- it's not even enough about giving. So many times this year, I have been asked what I want. I don't really want any stuff. I want to become a better Christian, but that is not a gift one can give. People are forgetting what the season is truly about- the birth of Jesus. So all of you, please remember the story behind the holiday. And I would appreciate comments; I love hearing other's points of view. Thanks! This is my personal favorite Bible chapter. It helps a lot when I'm scared, and need to trust in God. 1 The Lord is my light and the one who saves me. 2 Evil people may try to destroy my body. 4 I ask only one thing from the Lord. and look with my own eyes at his Temple. 5 During danger he will keep me safe in his shelter. 6 My head is higher than my enemies around me. have mercy and answer me. 8 My heart said of you, "Go, worship him." 9 Do not turn away from me. and say they will hurt me. I will live to see the Lord's goodness. 14 Wait for the Lord's help.